DANIELSON STAINLESS STEEL BENT NOSE PLIERS Made for cutting line, wire leader and lead wire, these 4-1/2" stainless steel side cutter pliers are an ideal fishing tool. 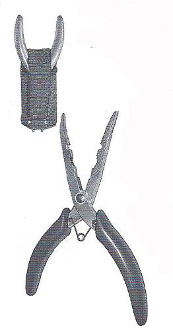 Spring action opens pliers when grip is released. Features include soft vinyl grip handles and a heavy-duty nylon sheath with sping steel belt clip. Also included, a 36" lanyard. One per package.